An audacious comic-book movie on steroids...cinematic junk food, but even a dieter deserves to cheat once in a while. 91 min. 20th Century Fox Distribution. Director: Mark L. Lester. Cast: Arnold Schwarzenegger, Rae Dawn Chong, Dan Hedaya, Vernon Wells, James Olson, Alyssa Milano, Bill Duke, Bill Paxton. I hesitate to call Commando a guilty pleasure (as I hate to legitimize the notion of any harmless pleasures being guilty), but it's the only way to explain why I would call this laughable '80s movie a classic of any sort. I hasten to add the context: a modern camp classic of the over-the-top action genre, but a sort of classic nonetheless. It's produced by iconic action producer Joel Silver, written by iconic action writer Steven E. de Souza (Die Hard), and stars none other than an ascendant Arnold Schwarzenegger. Schwarzenegger plays John Matrix (do you love this movie already? ), a retired Army colonel who lives in a remote cabin with his young teen daughter Jenny (Alyssa Milano). The film opens with a James Horner-scored montage that's presumably unintentionally funny in its depiction of daddy and daughter, with Jenny (clad in overalls and pink All-Stars) sticking an ice-cream cone in John's puss, and the two, wearing mile-wide smiles, feeding a baby deer. Gee, could anything interrupt this single-parent-family bliss? Well, yeah: Bennett (Vernon Wells), a former member of Matrix's unit, has been knocking off that ol' gang of his. Last stop: John's house, where Bennett manages to apprehend the Matrixes (Matrices?) and, by way of threat to Jenny, conscript John to commit a political assassination in Val Verde that will beneft a self-styled "El Presidente" named Arius (Dan Hedaya). Of course, these bad guys don't know what they're getting into, but it's the way that Matrix dispatches with their plan and devises his own that makes Commando so swiftly exhilarating. I wouldn't dream of ruining that plot twist, but it involves positioning Rae Dawn Chong (playing a poorly motivated flight attendant) as "the girl in the picture" and proceeds to a showdown in a mall, a car chase, the creative dispatching of henchman David Patrick Kelly (Jerry Horne from Twin Peaks), and the mother of all "shopping" scenes (move over, Pretty Woman) before allowing all hell to break loose at an island paramilitary compound. The finale makes Commando something like the Super Bowl of shoot-em-ups, an all-American precursor to John Woo. Since this is 1985, director Mark L. Lester can get away with certain stylistic flourishes that wouldn't pass muster today. This was the day of the R-rated action flick, when directors could chop a man's arm off with a machete in peace. No studio suit would think of intruding on cramming the leading man's absurdly muscled physique into nothing but a Speedo before a suiting-up sequence of strap-on weapons. Ah, for the days when action heroes spoke in comically threatening catch phrases, like "Let's party" or "I'll be back" (a nod to the same line in Schwarzenegger's breakthrough flick The Terminator). De Souza supplies corny and creative profanity, as well as plenty of patter, like Chong's query to Arnie "Did anybody ever tell you you have a lot of hostility?" Commando of course glorifies American gung-ho killing might even as its hero continually affirms he's no longer interested in that life. But the movie is cheerfully and totally removed from reality. After all, Arnie lifts up a phone booth with a man in it and breaks chains with his bare hands (I haven't even mentioned the rocket launcher). It's an audacious comic-book movie on steroids. Yes, I'm guilty about even marginally recommending this cinematic junk food, but even a dieter deserves to cheat once in a while. 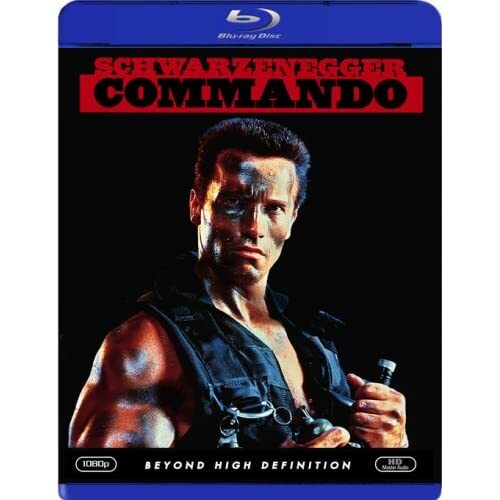 Fox's nearly bare-bones Blu-Ray of Commando represents one of the earliest Blu-Rays for the market, pulled from schedules and then released recently amongst more feature-laden competition. Though on the grainy side, this transfer represents an improvement over the DVD, and the Lossless Master Audio surround soundtrack well serves its dated source, so fans of the film may not be able to resist picking up this oft-reissued title yet again. I suppose D-Box Motion Control System owners will be excited to learn that this disc is enhanced for that very system (wired recliners? ), but the rest of us will have to settle for the film's Theatrical Trailer (1:50), presented in HD. Also included are previews for Alien vs. Predator, Behind Enemy Lines, Phone Booth, Planet of the Apes, and The Transporter. All site content © 2000-2019 Peter Canavese. Page generated at 04/18/2019 04:19:24AM.